Hardus Viljoen took his second five-wicket haul of the season as Derbyshire established a useful position against Sussex on day 2 of their Specsavers Championship match at Hove. Replying to Derbyshire’s 338, Sussex slumped from 62 for 1 to 149 for 7 before rallying to 256 for 8 at tea with Luke Wright unbeaten on 59. In 12 overs either side of lunch paceman Viljoen had picked up five wickets, with Luke Wells (46), Stiaan van Zyl (17) and Chris Nash (20) all clean bowled. Sussex were in danger of having to follow on but Wright and David Wiese batted responsibly to add 80 in 24 overs for the eighth wicket before Wiese pushed forward to 16-year-old off-spinner Hamidullah Qadri and was caught behind for 47. Wright reached his fourth half-century of the season, from 102 balls with five fours, shortly before tea. @SDHoneymonster - don't get me on the subject of the England selectors! Yorkshire openers Shaun Marsh and Tom Kohler-Cadmore replied strongly to Surrey’s mammoth first innings total of 592 in the Specsavers County Championship Division One match at the Kia Oval – after Kumar Sangakkara and Ben Foakes had earlier completed superlative second day hundreds. At tea Yorkshire were 78 for no wicket with Marsh on 35 and Kohler-Cadmore 39. It was the highest opening partnership of the season for the 2014 and 2015 champions, ironically by a makeshift pair only brought together because of the absence of Adam Lyth on paternal leave. Australian left-hander Marsh will also be replaced as overseas player by West Indies opener Kraigg Brathwaite for Yorkshire’s last two championship fixtures of the summer. Sangakkara eased to a magnificent 164 from 187 balls, with three sixes and 21 fours, and it was a seventh century of the summer for the remarkable 39-year-old, in his 12th championship innings. Foakes, however, the 24-year-old keeper-batsman who is pushing hard for an Ashes tour place, did not lose much in comparison even with Sangakkara in his 110 from 174 balls, with 19 fours, and he also oozed class in a memorable fourth wicket partnership which began just before tea on the first day and was eventually worth 258 in 55 overs. Pushing on from an overnight 398 for 3, in which they had already reached 85 and 64 respectively, Sangakkara and Foakes entertained a good-sized crowd with a brilliant exhibition of batting in which effortless big hits were mixed with beautifully deft touches as the pair added 115 in a little over 20 overs in the opening session. Sangakkara was eventually caught at long leg, mis-hitting a pull at Jack Brooks, who then had Ollie Pope caught at second slip for a first ball duck. And, by lunch, Brooks had also bowled Sam Curran for 5 with one that seemed to keep low and finally ended Foakes’s fun, courtesy of a fine tumbling catch by keeper Andrew Hodd from an edged drive. After lunch, Rikki Clarke hit out to reach 41 before becoming a third late victim for seamer Steven Patterson, who had also removed Freddie van den Bergh and Stuart Meaker in successive balls. @StaggerBreaths just didn't feel as if there'd been enough heated debate today. Seriously though, oft neglected when it comes to England's selection issues is that two of their selectors have a day job in county cricket. Kent haven't poached (unless we count picking up discarded players like Stevens? ), nor do they currently have any kolpaks. I think. @DaveKnibb - i'm happy with no Kolpaks. There's only a couple of counties that abuse it and Surrey isn't one. @WillColwell SHOVE IT UP YER A**E, THEY'RE THE BEST COUNTY IN THE WORLD! * NEVERMIIIIIIND ANYONE ELSE. In theory once we leave EU no more Kolpacks? Yes, neglected counties! That's a can we haven't opened yet. Can opener, SDHM? @Dez So how many Kolpaks come in before you draw the line, 3 per team? 5 per team? 7 per team? where is the limit? When there's 9 will you jump up and down? Or will it be too late? If Coverton played for Middlesex or Notts he'd have had a Test cap ages ago. ...except for Durham who can't afford to poach or Kolpak. So to conclude; All counties have a similar amount of home grown players, a spoached egg here and there, an overseas or 2 and then a select few counties also have Kolpaks. What was all the fuss about? @Dez They are, they help to keep us competitive but they really shouldn't be playing for us, we were 'Kolpakshire' a few years ago and it isn't right. I don't defend Northants at all with the Kolpak players, no matter how good they are. 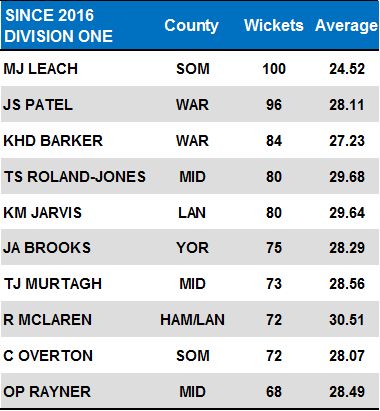 Interesting that two of the top three on that wicket taking list are Bears considering how rubbish they've been over the past couple of seasons. Kleinveldt's practically county proper now, he fits right in. Got the figure for it. @DaveKnibb - are Levi & Kleinveildt Kolpaks? You mean he might take one in every two catches? @joe Good view on poaching by a Big County fan, you would think that. Maybe you wouldn't if you were supporting a poorer county. The Kolpak thing isn't really excusable, Hants tried to say that Roussew would help the young english players to develop, but how did his signing help Alsop who got pushed into the second XI? I don't really see how any Kolpaks are justifiable, you might just as well allow 5 overseas players per team if your going to have 4 Kolpaks, at least the standard would be higher. The main reason to take Leach down under would be to have YJB going 'NOICE GARY' every ball and p**sing Wade off.